Available from Novasys Group , Sheen automatic film applicators are designed to prepare uniform films of controlled thickness for use in testing of surface coatings. Uniform films are necessary to obtain reproducible results from physical, appearance and chemical performance testing of surface coatings. This can be difficult to achieve with hand application methods, which often result in variations between operators. 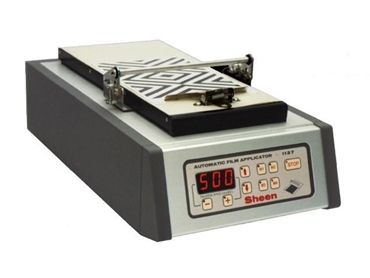 Sheen’s automatic instruments have been designed to produce consistent results when used with a wide range of different applicators including block spreaders, wire wound bars, bird type applicators, sag index applicators, and sagging and levelling testers among others to provide the benefits of reproducibility and control of application. A unique drive system in Sheen automatic film applicators has been designed to run smoothly with all types of coating material at all film thicknesses to eliminate the ‘banding’ that can occur with thin film coatings such as inks and transparent coatings such as woodstains or automotive clearcoats. Model 1133N is additionally equipped with a vacuum plate to securely hold substrates, especially thin substrate materials during the application process. Model 1137 can be used with all Sheen film applicators and 18cm film width wire wound bar applicators.